CRM: It’s a term that’s thrown around a lot, but what is it really and do you need one? CRM stands for Customer Relationship Management. It refers to any system or practices you have for interacting with customers. A spreadsheet with customer names, addresses, and when you last contacted them is technically a CRM system. But that sort of CRM is not what people talk about around the water cooler. Usually, when people talk about a CRM, they’re talking about specific software or a cloud-based product that’s built, sold, and managed by a B2B company. Most available CRM systems offer a whole lot more than a spreadsheet, such as the ability to follow individual customer behaviour, track overall sales, analyze patterns, and manage communications across multiple channels. A good CRM will help your sales, marketing, customer service, research teams—really your entire company—keep their eyes on the customer in everything you do. You can even go after investors and potential hires with good CRM tools. It’s all about which tools you use and how you use them. Do I Need to Invest in a CRM? If I can get by with a spreadsheet, why do I need to buy a CRM from someone else? The answer is that you don’t, necessarily. If you only have a handful of clients, aren’t looking to grow, and don’t have data to track, then a spreadsheet, an email account, and a couple of social media profiles may be all you need. For now, at least. If you want to expand your customer base, build brand awareness, or grow your company in any way, then you’ll need to invest in a better system. Consider the time you’d spend maintaining just a handful of email contacts, analytics, customer communications, and sales data with one spreadsheet. Now imagine you have 50 customers. Then 100. What happens when you have thousands of customers? The truth is, you’d have a hard time creating a marketing plan to gain hundreds of customers without a good CRM in the first place. Just ask the 65 per cent of businesses that adopt a CRM within their first five years. Or the 53 per cent of top-performing companies who are investing in a CRM. Eventually, you will need to invest in a CRM. How much you invest depends on your goals. 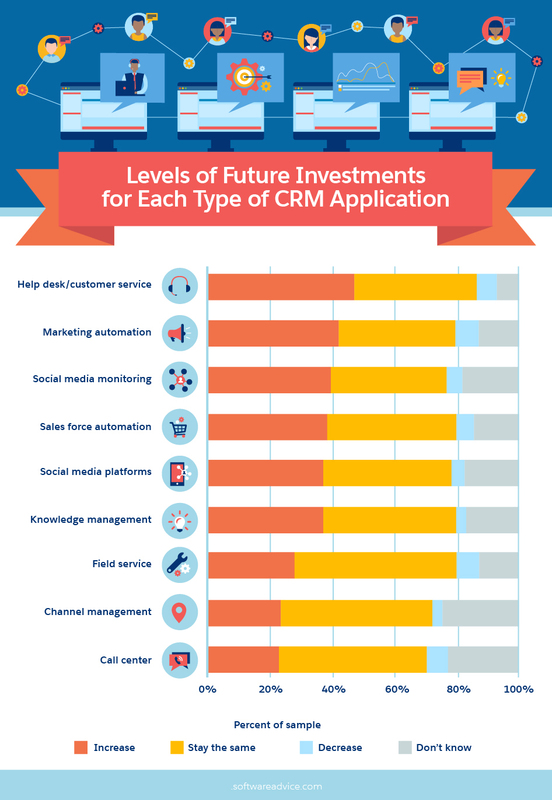 With so many companies investing in a CRM platform, there have to be some pretty awesome benefits, right? There are. How a CRM can help your business is all about what features the system offers and how you use them. So what are your CRM goals? Manage leads and contacts from anywhere. Capterra reports that 80 per cent of CRM users are sales people, and 18 per cent of all CRM-using companies are in retail. Why? Probably because CRM adoption can increase sales by up to 29 per cent. In the same realm (sort of) as sales are investor relations. If you plan on eventually selling your company to gain capital, a CRM will help you keep up with donors and investors, too. Customer service isn’t as simple as having a call centre anymore. Now customers expect their issues to be resolved via email, social media, and on your website, too. A quality CRM will offer ways of tracking customer interactions across multiple channels so you can offer personalized service no matter who handles the ticket or where your customers are—without having to chase them down. In fact, sales reps who added social networking and mobile access to their CRM usage saw a 26.4 per cent increase in productivity. One of the greatest challenges of marketing is balancing the ability to personalize messages to individual customers while keeping your marketing efforts efficient so they reach enough customers. The best way to maximize both is with automated marketing tools that allow you to segment your audience and respond to changing circumstances to get the right message to the right person at the right time. 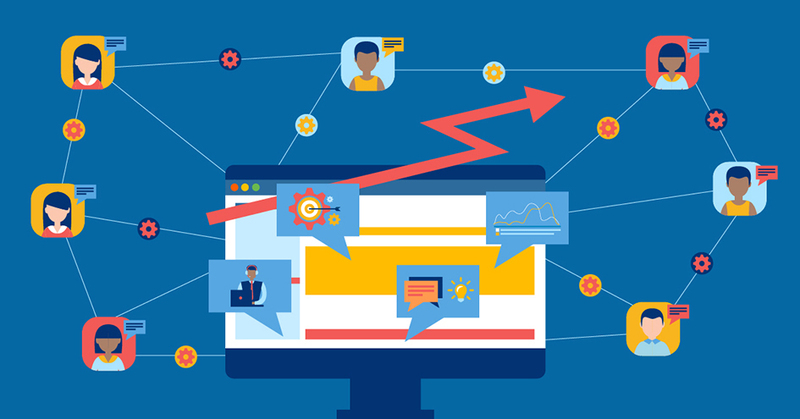 The fact is, 80 per cent of marketing automation users saw increased leads and 77 per cent saw their number of conversions increase. Did you know that 79 per cent of all marketing leads never get converted to sales? Your marketing team works hard for those leads by creating a unique marketing strategy, often recreating the same content to fit multiple social media, email, advertising, and web channels to reach potential customers across numerous brands. Since most leads won’t translate to revenue, it makes sense to cut down the resources required to gain them. The benefit of a CRM system is only having to create materials once, while still delivering personalized, cross-channel customer journeys that you can track and analyze. The key to great marketing, sales, and service is analytics. Unfortunately, it’s not enough to know your customers, your industry, and your market. It won’t give you an edge like it used to because everyone is doing market research. You need good data just to keep up with the Joneses. In today’s data-rich landscape, getting enough information isn’t the problem. It’s sorting through all the data to find what matters to get a complete picture. A CRM can help do that for your company. Many marketers say that having multiple, siloed data sources is the main reason they cannot gain useful insights from customer data. If you employ a CRM’s sales, service, and marketing features, then chances are you’re already tracking plenty of data. Add analytics to your system and you’ll be able to look at datasets in multiple views, drill down, and ask important questions, all without having to wait for your own analysts to sort through it. Look for CRM analytics that are easy to use and offer customizable reporting to match your unique needs. When choosing a CRM, you’ll be faced with choices. Which features are most important for your company? How much should you invest? 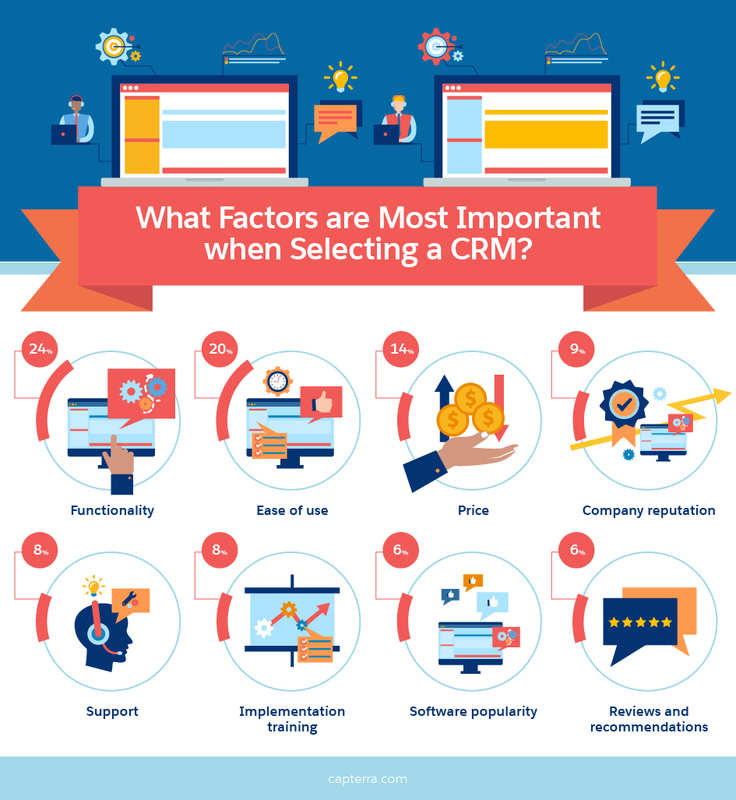 Which CRM is right? You’ll also need to decide between a cloud-based system or a software- or hardware-based system. A software- or hardware-based system will need to be installed on site, probably with the assistance of a technician from the CRM company or a consultant you hire separately. The benefit of this type of system is that you could have complete control once you’re set up. The bad news is that it’s a little harder to go mobile, and maintenance can be a pain if you don’t have a dedicated IT staff. Cloud-based solutions don’t require onsite installation (it’s web-based), so you can get started faster. Maintenance is handled by the CRM company and updates often roll out automatically. Plus, most cloud-based systems are easy to use from anywhere—on tablets, smartphones, and your home computer—so you can get things done no matter where you are. For companies with employees who spend a lot of time traveling, in the field, or at business lunches, mobility is imperative. Did you know that 60 per cent of customers change their contact channel depending on where they are and what they’re doing? How often would you say your sales, marketing, and service teams need to switch channels or handle business on the go? Our guess is pretty regularly. How do we know? Studies show that in companies that have adopted a mobile CRM system, more sales reps meet their quotas. Furthermore, sales reps who add social networking and mobile access to their CRM usage see an increase in productivity. A mobile, cloud-based system could be a game-changer for your company, too. How Big Are You? How Big Do You Want to Be? The simple answer is yes. Every company needs a system for managing customer data, interactions, and other information. But depending on the current size of your business, you may not need to invest much in one. But if you're ready to take your business to the next level, or just want to stop pulling your hair out trying to keep customer records straight, then yes: You should invest in something with more power. How much you should invest depends on the size of your business and its goals. One thing every business should keep in mind is the document you created at the beginning of your business adventure: your business plan. It’s your blueprint for scaling up your business and, therefore, your plan for scaling up your CRM system, too. Before choosing a CRM, take some time to create a “CRM Plan” that complements your business plan. Does your success depend on a steady stream of new leads? Invest in tools that streamline your marketing efforts. Looking for loyal, lifelong customers who make regular purchases? Focus on customer service tools. Need investors right away? Sales tools might be able to help. Not every company has the budget for all the bells and whistles immediately, and that’s okay. You have to start somewhere. Whatever your budget, ask yourself what tools or features would be a game-changer for you right now. Your first investment needs to bring in enough revenue to fuel your CRM budget for growth. Know where you’re headed? Great! Now it’s time to take a hard look at the CRM systems out there and make sure they can offer solutions that will help you meet your goals. Look for companies that offer a variety of features in both packages and a la carte options: Your CRM should be flexible enough to grow with you. If not, you may have to invest in a whole new system when you outgrow this one, or risk stagnation. That could mean another installation, costly down-time, and learning a whole new system. Avoid it all by simply choosing the right CRM the first time. More and more businesses are adopting a CRM system. Last year alone, worldwide CRM software investments totaled $26.3 billion, up 12.3 per cent from the year before. Is it time for your company to join in? Companies have turned around low conversion rates, poor customer service, and ineffective marketing strategies with a good CRM. 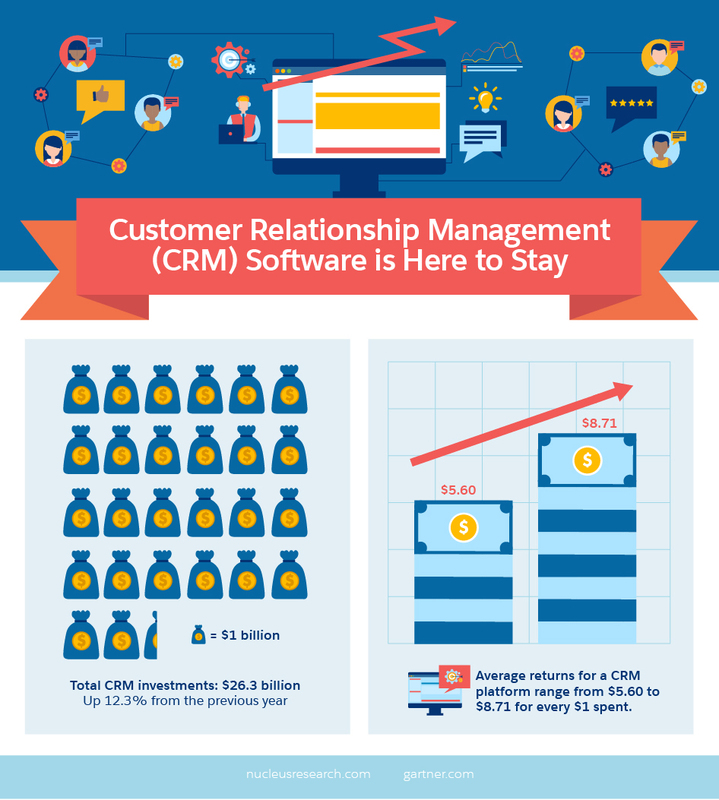 Average returns from using a CRM platform have increased since 2011, from $5.60 to $8.71 for every dollar spent. However, before adopting one, make sure you understand both the price tag and any additional costs that come with a new system. Get an idea of the learning curve your team will face by talking to other CRM users. Keep in mind there may be installation costs, such as consultant fees and down time. Last but not least, be aware that some businesses experience employee push-back. Some workers may take some convincing before coming on board. Instead of surprising your team with a new CRM, get their input on what they’d like to see. Your sales, marketing, analytics, and service people can be a great source of insights on your needs, and involving your staff in the decision-making process allows them the chance to see how such a system would be a benefit to them. Lastly, speak with a representative from potential CRM providers to ensure that their system is compatible with other software and systems you currently use so there are no surprises. Investing in a new CRM is time-consuming, and it’s important to weigh your options, but implementing the right system for your company will take it to the next level.